Cells are as wide as long or slightly wider than high. In exponentially growing culture, cells of ACPP01 are 34.3 ± 2.92 µm (min 30 µm, max 38 µm, n = 20) wide and 35.7 ± 3.39 µm (min 30 µm, max 40 µm, n = 20) long, with a L:W ratio of 1.04. Cell contains many golden brown elongated chloroplasts and a horseshoe-shaped nucleus located in the equatorial part of the cell. The epicone is helmet-shaped, often presenting more or less noticeable shoulders, and the hypocone is roughly trapezoidal. The cingulum is descending about one cingular height. The sulcus broadens in its antapical portion and is delimited on both sides by moderately developed sulcal lists. The cell surface is smooth and ornamented with many scattered small pores. The plate formula is: Po, 4’, 6’’, 5C, 8-10S, 5’’’, 2’’’’. Po is rather wide, ornamented by several small pores and presents a comma-shaped foramen. A connecting pore is generally present on Po. Plate 1’ is irregularly rhomboidal, with longer apical right and antapical left sides; in its apical portion, it contacts Po and in its antapical portion it contacts plate Sa. The ventral pore along the margin between Plate 1’ and 4’ is generally not present. Plate 6’’ is as wide as tall or slightly wider than tall. Plate 2’’’’ is generally transversely extended. Plate sp is pentagonal, and its length:width ratio is ∼ 1; a connecting pore is generally present on sp. In natural samples, cells can be arranged in chains or single. The cyst is ellipsoidal, with a granular dark brown content and is surrounded by a mucous layer. 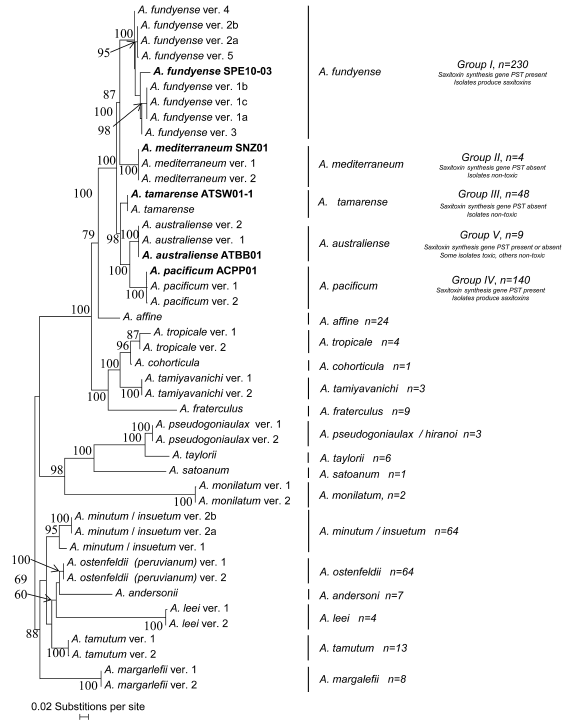 The species is defined by the combined nucleotide sequences of the holotype strain ACPP01 D1-D2 LSU (GenBank KF908803), ITS/5.8S (GenBank KF908812), and SSU (GenBank KF908800). All isolates examined to date are toxic to some degree. The species name is Latin for ‘from the Pacific Ocean’ and was chosen because the strains found to have this genetic sequence were originally isolated from Japanese, Korean, Australian, and western Pacific Ocean sites (Scholin et al. 1994).